It is one of the wonderful things that happen in the Mid Century years, were the crafts. So many fun colorful projects to design. 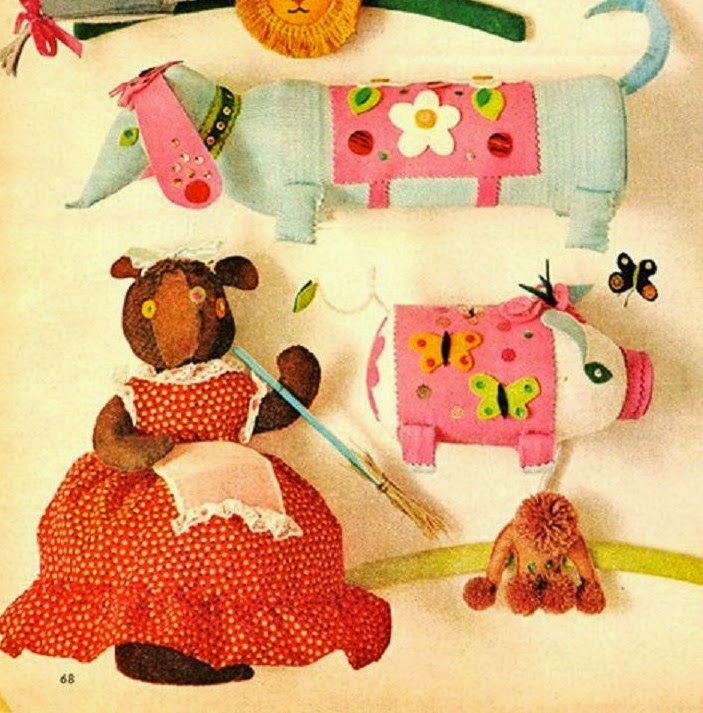 And McCall's Magazine had a dedicated issue for these crafty projects. This is a page out of the Spring/Summer 1963 magazine. I came across the image in Pinterest and followed it back to the original blog post. There is so many neat things to read about and see at the "Cathy of California" blog... be sure to click around and take in all the craftiness! This was posted back in 2007. I recall from my 7th grade Home Ec. class, that we were require to do a needlework project. 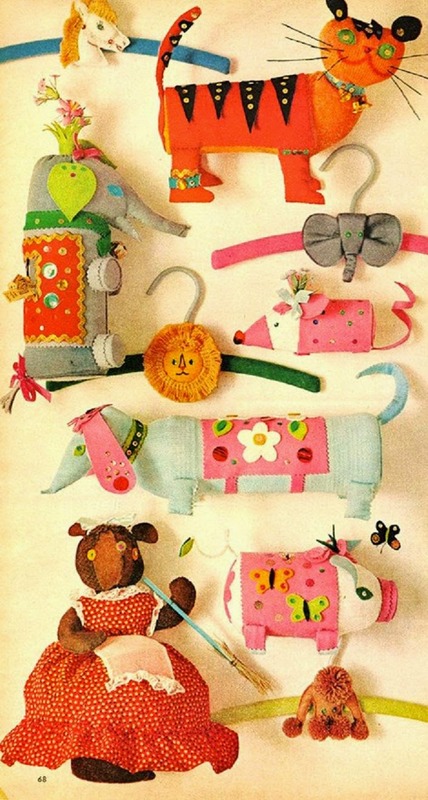 These were basically a stuff animal pillow that had a lot of felt cuts out... that were hand sewn onto their bodies. A lot like the pig and dog here. I did a yellow rabbit. That had white ears. I recall that there was a goofy pillow in the shape of a blue tennis shoe roller skate! Ugh. Does anyone else recall those when they came out in the late 70's? There was a magazine that we were allowed to pick out our project and they came in a great plastic handle bag with all the materials inside. So as you worked on it. You had a nice handle bag to place it all back in, to keep it all together. Anywho... this page from McCall's reminded me of that middle school project. 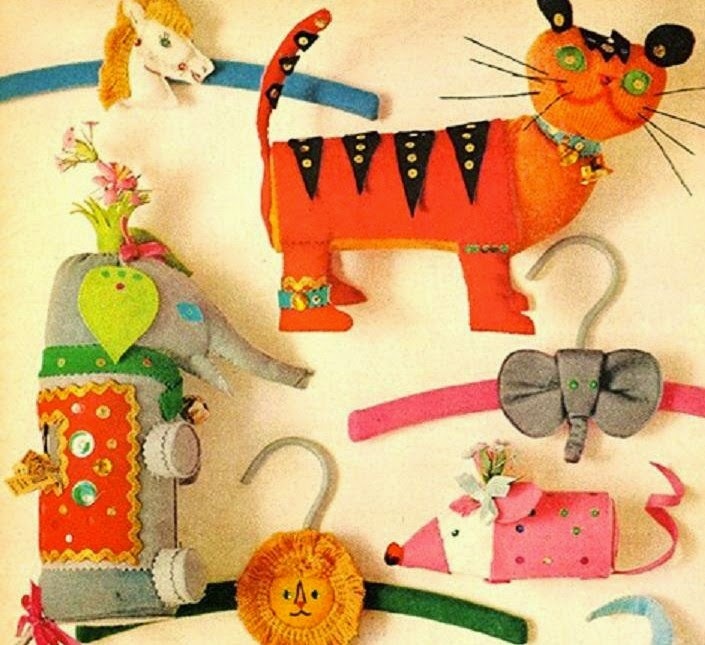 How cute are those clothes hangers with the animal heads?!? I have several of those magazines and love them! I have made some of the creations from them too! 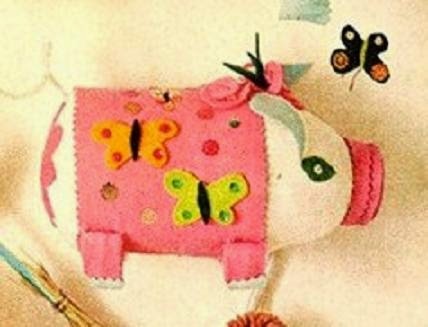 That pig reminds me of the one I made in Bible School from a Clorox bottle!